Agate Studio’s Dungeon Chef is a cooking game with a twist! It lets you fight monsters and slay them for their meat. But the fun does not stop here. Upon returning home, you can use all ingredients, including monster meat, to cook lip-smacking food for your customers. Your customers will happily pay for the delicious food served to them at your grandpa’s tavern. The game is easy to play. Go to dungeons and battle monsters, kill them to acquire ingredients and cook them at your tavern’s “Kitchen”. But before doing anything else, check what customers want by tapping the “Orders” Tab. Complete orders to get coins and XP. The experience points earned from completed orders fills the EXP status bar located at the top-left corner of the screen. Once EXP bar is full, you will reach a new level and also unlock a new dungeon, where you can slay another ferocious monster to obtain its meat and other key ingredients. When you tap the “Order” button, you will see a variety of food orders from customers. Your priority is to prepare meals that require less preparation time and ingredients. Scan the entire order section and make those “starters” whose preparation time are less and require only one ingredient. “Miconid Stock” is an example of a dish that requires only one ingredient, i.e. Miconid Slice and the preparation time is only 30 seconds. You will find at least 2-3 customers ordering this dish. Another recipe is the Cockatrice Consomme – It requires Cockatrice meat and one can finish cooking it in 40 seconds flat. These two dishes require the meat of two monsters Miconid and Cockatrice. You can play these two monster levels and get their meat. Once you have enough meat, you can start taking orders and make these two dishes first to get XP and coins quickly. Main dishes require extra ingredients along with the main ingredient, i.e. the slain monster’s meat. You can get these secondary ingredients by replaying dungeons that drop them. For example: For the Steamed Spicy Cockatrice recipe, you will need extra ingredients like the Lava Chilli, Pepper and Scallion. To get them, you will need to replay dungeons such as the Brimy Grassland and Misty Wilderness to find these secondary ingredients. Sometimes, you will have to play the same dungeons again and again to get them. To know a list of possible ingredients drop, tap the “Enter” button on a dungeon. You will see the list of items just above the green “Battle” button. Play that level if the list contains the required ingredient. Secondary ingredients are rare and you may have to replay a dungeon several times to get them. Chances of an ingredient drop are higher if you are quick in killing a monster before it inflicts major damage to your character. You will receive three stars if you slay a monster and take less damage. When you get three stars in a dungeon battle, you also stand a chance to acquire secondary ingredients from the slain monster. Upgrade your weapons at the “Blacksmith” (Market > Blacksmith). This will not only allow you to get more meat from a monster, but also let you kill it faster. While battling, tap the attack button rapidly to drain enemy HP faster and make use of the shield (Defend button) to block monster attacks to preserve your HP. 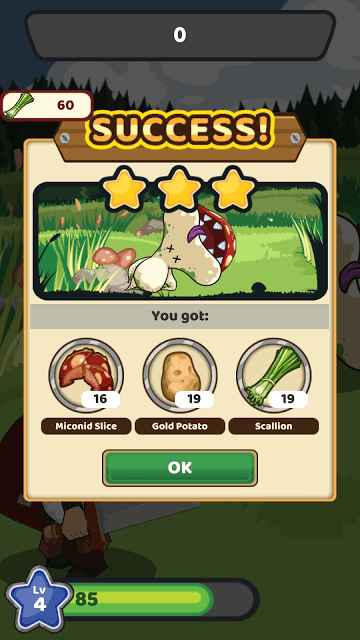 If you don’t have the patience to battle monsters in dungeons and quickly need ingredients, then you can use coins earned from your customers to buy them at the grocery. Go to Market > Grocery and purchase ingredients which you don’t have. You can buy ingredients in packs. The rarer the ingredient, the more coins you will have to spend to get it. To earn coins from customers, start preparing dishes that require the main ingredient only and serve them to your customers. Go to “Order” and look for easy-to-prepare dishes. You can save coins only for grocery purchases and try not to use them in upgrading your weapons. The cute little fairy hovering over your customer at the tavern can help you get the required cooking items. Just tap her when she turns golden in color to get lots of random ingredients like potatoes, chilies, pepper, rice, garlic etc. You can also tap the fairy when she does not change color, but you should wait for 40 seconds and then tap her to get a few ingredients. You can also get ingredients by tapping the leprechaun. He will drop rewards such as coins and food items. Mr. Herveus comes to your tavern every day. Collect and save crystals for an extra stove slot. You will need 25 crystals to expand your stove. Get these pink jewels by completing achievements and by reaching a new level. You can also get crystals by watching an ad (tap the “wanted” signboard on your tavern to watch an ad). Certain recipes need a different kind of stove. For most steamed and soup recipes, you will need “Boil” stoves. For process recipes like the Boarzilla Bacon, you will have to tap the “process” tab to make them. There’s also the “Other” stove which is used to make a variety of other recipes such as the Miconid Samosa. Just tap a stove to check the list of meals you can prepare for your customers. The Inventory section under “Kitchen” has a list of all ingredients you have acquired from a dungeon level or purchased at the grocery. Buying costumes does have an effect on battle and cooking. Tap black market and then tap “Tailor” to get a list of snazzy outfits for your character. The cheapest outfit will cost only 25 crystals. Example: choosing the “Cool Kids” costume, which costs 25 crystals, will earn you one percent discount on all groceries in the market.